At least 440 Palestinians were injured in the West Bank in violent clashes with Israeli forces during protests held in solidarity with Palestinian prisoners in Israeli jail, the UN office for the coordination of humanitarian affairs (OCHA) said in a new weekly report. The report, which covered some of the Israeli violations against the Palestinians from 19 to 25 February, added that these clashes escalated following the death, on 23 February, of the Palestinian detainee Arafat Jaradat in Megiddo Prison. His death angered the Palestinians whose protests were responded to by Israeli soldiers with tear gas canisters, rubber-coated metal bullets and live ammunition, the report said. Over half of those injured were treated for tear gas inhalation, and one third for injuries sustained from rubber-coated metal bullets, while 16 Palestinians sustained injuries from live ammunition and the remaining from other means, according to the report. In the gravest incident, a 16-year-old boy from Ayda refugee camp was seriously injured in the head by live ammunition fired by Israeli troops. The report also pointed to the remarks made lately by the special coordinator for the Middle East peace process, saying that he called on Israel to fully respect the human rights of all Palestinian detainees and prisoners in its jails. OCHA quoted him as saying that "those held in administrative detention should be charged and face trial with judicial guarantees in accordance with international standards, or promptly released." "He also stated that the United Nations expects the autopsy to be followed by an independent and transparent investigation into the circumstances of Mr. Jaradat's death, the results of which should be made public as soon as possible," it added. Its report also covered in detail the settler-related incidents, saying that at least 28 Palestinians were injured and different kinds of their property were destroyed in settlers' attacks during the reporting week. The Ahrar Center for Detainees Studies and Human Rights reported, Thursday, that Israeli soldiers kidnapped 382 Palestinians, including 10 women, in different parts of the occupied West Bank, and the Gaza Strip in February. The center said that six Palestinians were kidnapped in the Gaza Strip while the rest were kidnapped in the West Bank, including 10 who were kidnapped in Nablus, in northern West Bank. Some of the kidnapped Palestinians were released later on. Two patients were kidnapped at the Beit Hanoun (Erez) terminal, between the Gaza Strip and Israel, despite the fact that they were granted permits to enter Israel for urgently needed medical treatment. Three of the Palestinians who were kidnapped in the West Bank have been taken prisoner at the Al-karama between the West Bank and Jordan; one of them is a local Caricature identified as Mohammad Saba’na. Furthermore, the army kidnapped several political leaders of the Hamas movement, including three elected legislators. The Ahrar Center said that the arrests carried out by the army in February witnessed a sharp increase comparing to January as the army kidnapped 350 Palestinians last month. 3 Palestinian civilians, including a child, were wounded in the northern Gaza Strip. 9 Palestinian civilians, including 3 children, were wounded in different shooting incidents in the West Bank. 8 of whom were wounded in Qasra village, southeast of Nablus, during a joint attack launched by the Israeli forces and settlers. The Israeli forces conducted 51 incursions into Palestinian communities in the West Bank. At least 56 Palestinian civilians, including 26 children, were arrested. 36 of whom were arrested during incursions, 17 in peaceful protests and 3 from their farmlands. The Israeli forces continued to attack Palestinian fishermen in the sea. A Palestinian fisherman was wounded and fishing boats were attacked 7 times during the reporting period. 14 Palestinian civilians, including 4 children, a woman and a journalist, were wounded in protests against the annexation wall and settlement activities. 33 Palestinian civilians, including 9 children, were wounded in solidarity demonstrations supporting the Palestinian prisoners in the Israeli jails. At least 4 Palestinian civilians, including a child, were arrested at checkpoints. The Israeli forces confiscated 3 truckloads of base course during the establishment of a street in Hebron. Many Palestinian farmers were denied access to their farmlands adjacent to settlements. The autopsy report prepared by Dr Saber al-‘Aloul, Director of the Palestinian Medico-legal Institute on Arafat Jaradat, a Palestinian detainee who died in an Israeli prison, has concluded that Jaradat’s death was caused by nervous shock resulting from severe pain, which was caused by multiple injuries inflicted through direct and extreme torture. Arafaf Shalish Shaheen Jaradat, 30, from Sa’ir village northeast of Hebron in the southern West Bank, died in Megiddo Prison inside Israel on Saturday, 23 February 2013. Israeli authorities claimed that he died due to an apparent heart attack, but the Palestinian Authority and numerous human rights organisations raised doubts concerning the Israeli narrative, and are calling for an independent investigation into Jaradat’s death. The report indicated that there were multiple injuries on Jaradat’s body. For example, the report stated: There are recent excoriations and bruising on the inside of the lower lip; there is severe bruising on the upper right back; there are circle-shaped bruises on the bottom of the front right side of the chest; there is bruising on the facis lateralis brachii of the left elbow; there is bruising on the back of the right arm; there are deep bruises, 4x9 centimetre in diameter, on the muscle of the upper left shoulder, adjacent to the spine, below the neck; the bruises damaged the tissue of the muscle; there are 4x10 centimetre bruises on the right side of the chest; the bruises penetrated the skin and caused damage to the muscle tissue; they were located 27 centimetres from the spine, 53 centimetres below the top of the head; there is a fracture in the second and third ribs on the front left side with bruises around the fracture; and there is a fracture in the second rib on the front right side of the chest. The report emphasised that all fractures or wounds were recent, that the injuries were severe, and had resulted from direct and extreme torture. According to PCHR’s documentation, this case is part of a phenomenon in which thousands of Palestinian detainees in Israeli prisons and detention facilities are subjected to torture by Israeli security services. 5- Calls on the United Nations, the International Committee of the Red Cross and the international community to put pressure on Israel to put an end to the use of torture and to open prisons and detention facilities for monitoring. The draft, obtained by +972 Magazine and published here in full, is to be presented to the EU’s Political Security Committee (PSC/COPPS). Among its recommendations are preventing financial transactions that support settlements and informing EU companies of the legal and financial risks of doing business with and in Israeli settlements. The report was prepared in January 2013 and covers 2012. It is followed by a recommendation that the EU inform businesses of the “financial and legal risks involved in purchasing property or providing services in settlements. ”The implication of this recommendation is that any EU-based company that invests in and provides services for settlements could be held legally (and financially) liable for supporting the illegal enterprise. While European companies like Veolia have long been targeted by activists for owning and operating land fills, waste-water treatment facilities and buses that serve Israeli settlements in the West Bank, implementing this recommendation would constitute a direct and official warning to similar companies by the EU itself. Written in between the lines of the EU heads of mission report on Israeli settlements is a sense of frustration with the EU’s inaction against Israel. The EU makes regular statements against Israel’s illegal settlement enterprise, but takes no action despite the existing tools it has at its disposal. 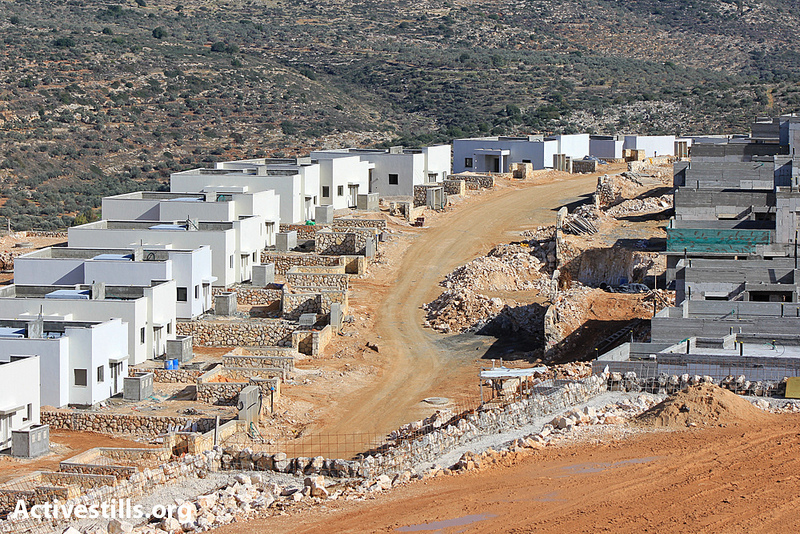 At face value, the European Union heads of mission report on the Israeli settlement enterprise is a scathing indictment and call to action against Israel’s illegal settlement activities. In between the lines, however, the report reflects a frustration by European diplomats and bureaucrats at their own governments’ inaction. They are not implementing the existing legislation, decisions and declarations they themselves regularly make against Israel and its settlements. The EU’s rhetoric against Israel’s settlement policies has always been damning, but its actions have never lived up to its words. “The EU and its member states now face the urgent challenge of translating the observations and recommendations of their own senior diplomats into concrete and effective policies that indeed maintain the possibility of the two-state solution,” a document obtained by +972 stated. This is a clear call to action – a frustrated plea by the EU’s professional ranks to their elected bosses to put their money where their mouth is. Without action, the almost predictably regular condemnations of Israeli settlements by EU foreign policy chief Catherine Ashton, unequivocally declaring them illegal under international law are just that: empty statements and declarations. The power of such a wide union of developed and influential countries such as the EU is meaningless if it limits itself to declarations and condemnations instead of exercising the power it is sitting on. The message these diplomats are sending is that principled and legal stands against illegal settlements – and in favor of a two-state solution – are in vain if it takes no action. But the report’s recommendations are not groundbreaking. They are based on existing resolutions, legislation, trade agreements and declarations by the European Union, its legislative and diplomatic bodies and its individual member states. The EU-Israel Association Agreement, which established the free trade agreement and close diplomatic cooperation between the two is explicitly clear about the conditions necessary for its continued existence. As far as the EU is concerned, a two-state solution is the only way to ensure that human rights and democratic principles are respected for both Israelis and Palestinians. It is also clear that the EU believes settlement activity is the primary obstacle to achieving a two-state solution. In other words, they are saying that Israel is actively working against a two-state solution, and therefore against the foreign policy interests of the EU. The European Union is Israel’s largest trade partner and holds tremendous influence due to the free trade agreement that benefits Israel far more than it does the EU or any of its individual member states. The EU long ago gave itself the tools to put pressure on Israel to correct its ways. These diplomats are begging their governments to use them. However, foreign consulates in Jerusalem and Ramallah are known to be much more blunt in their criticism of Israeli policy than their sister-embassies in Tel Aviv. So just as it is not surprising that such a frustrated and damning document came out of the consulates, we can expect that it will be ignored like all those that preceded it. 2 gravel collectors were wounded in the northern Gaza Strip. 5 Palestinians, including a child, were wounded in different shooting incidents in the West Bank. The Israeli forces conducted 58 incursions into Palestinian communities in the West Bank and 2 limited incursions in the north and south of the Gaza Strip. At least 38 Palestinian civilians, including 11 children, were arrested in the West Bank. 5 Palestinian civilians, including 3 children, were arrested in the central Gaza Strip when they attempted to cross the borders into Israel looking for work. 2 Palestinian fishermen, including a child, were wounded and 2 others were arrested off al-Sudaniya shore, north of Gaza City. 9 Palestinian civilians, including 2 children and a woman, were wounded in protests against the annexation wall and settlement activities. 21 Palestinian civilians, including 4 children, were wounded in solidarity demonstrations supporting the Palestinian prisoners in the Israeli jails. At least 14 Palestinian civilians, including 3 women, were arrested at checkpoints. A house in Beit Hanina village, north of East Jerusalem, was demolished and 12 persons became homeless. The Israeli forces issued more demolition notices for houses in the area under the Israeli control. The settlers continued their attacks on the Palestinian civilians and their property. 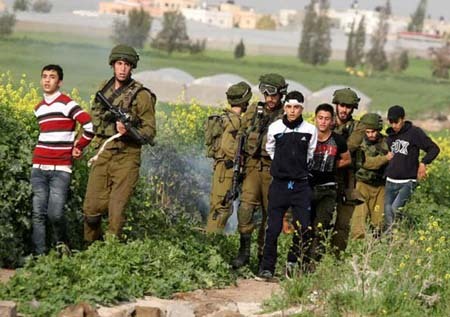 The Children’s Media Department at the Palestinian Ministry of Information reported that Israeli soldiers kidnapped 19 Palestinian children, and wounded dozens of children, in the first half of February. The Ministry issued a report stating that Israeli soldiers continued their attacks and violations against the children, and kidnapped 19 in different district in occupied Palestine, and added that dozens of children have been injured after being attacked by both Israeli soldiers and settlers. The report revealed that the kidnapped children have been violently attacked by the soldiers who invaded different cities, villages, towns and refugee camps in the occupied West Bank, and were moved to different Israeli detention camps and interrogation centers. Furthermore, two Palestinian children were shot and injured by Israeli military fire near the border fence, east of Jabalia, in the northern part of the Gaza Strip. Also, the report revealed that dozens of Palestinian children were injured by Israeli fire, and after being violently attacked by Israeli settlers. It added that most of the wounded children have been injured when Israeli soldiers attacked weekly nonviolent popular protests against the illegal Israeli Annexation Wall and Israel’s illegal settlements in the occupied West Bank. A report issued on Tuesday by Hamas stated that the Israeli regime demolished 465 Palestinian homes and structures last year in the occupied territories of the West Bank and Jerusalem. According to its report, Israel established 482 settlement projects in 2012, including settlements and outposts in the West Bank and Jerusalem. The report also covered Israel's violations that took place from 16 January to 15 February, including the Judaization activities that have escalated in Jerusalem. Hamas stated in its report that Israel pursues a mass punishment policy against the Jerusalemites and violates the international humanitarian law regarding the protection of civilians under occupation. It said that Israel targets the Palestinian presence in Jerusalem and work on forcing the Palestinian natives to leave their city in order to shrink their number and provide more homes and lands for the housing of Jewish settlers. "The occupation seeks to change the boundaries of Jerusalem city in order to secure a Jewish majority in the holy city through the building of the segregation wall at the expense of the Palestinian land, the annexation of the major settlements around Jerusalem to its borders in order to create territorial contiguity between them, and the isolation of Palestinian communities that has always been part of Jerusalem," Hamas emphasized. A report by Hamas movement in the West Bank on Monday said that Israeli occupation forces (IOF) rounded up 128 Palestinian citizens in the past week. The report noted that the IOF for the second week running focused on Hamas cadres and supporters. It said that most of the arrests were made in occupied Jerusalem with 35 civilians rounded up followed by Ramallah, 23, and Nablus 22. 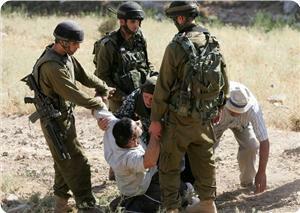 The remaining arrestees were taken from Jenin, Bethlehem, Al-Khalil, Qalqilia, Salfit, Tulkarem, and Tobas. The reported noted that a female student was among the detainees while 30 were minors in the age category 13-18. 4 Palestinian civilians, including a child and a journalist, were wounded in the incursions conducted in the West Bank. The Israeli forces conducted 77 incursions into Palestinian communities in the West Bank. At least 46 Palestinian civilians, including 8 children, were arrested in the West Bank. 6 children from the Gaza Strip were arrested when they attempted to cross the borders into Israel. The Israeli forces opened fire at the Palestinian fishing boats, but neither casualties nor material damages were reported. 4 fishermen, including 2 children, were arrested and then released after the confiscation of their boat. 3 Palestinian civilians, including a child and a journalist, were wounded in protests against the annexation wall and settlement activities. At least 18 Palestinian civilians, including 11 children and a girl, were arrested at checkpoints. 2 of these detainees were arrested at Beit Hanoun (Erez) crossing, north of the Gaza Strip. 4 houses, 3 tents, a barrack, a water well and a grocery shop were demolished. The Israeli government approved the construction of 436 settlement units in the West Bank's settlements.